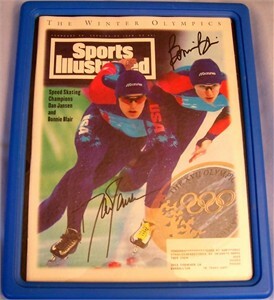 Complete 1994 Sports Illustrated magazine autographed in black marker on the cover by Olympic speed skating gold medalists Bonnie Blair and Dan Jansen in a simple aqua plastic and plexiglas frame, ready to hang. Obtained in person. With certificate of authenticity from AutographsForSale.com. ONLY ONE AVAILABLE FOR SALE.